Upgrade approximately 4,750 feet of Gold Mine Trail Road. 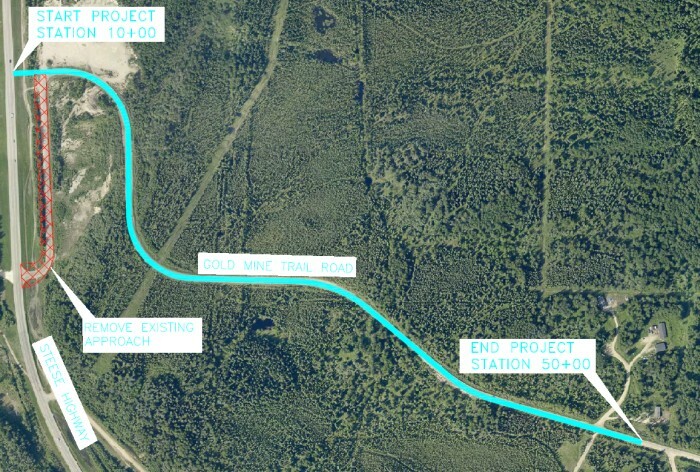 The hairpin curve, near the Steese Highway will be eliminated, the first 1,100’ of the road will be abandoned and demolished, and a new approach to the Steese Highway will be constructed. All culverts will be replaced. The first 800’ of the road (near the Steese Highway) will be paved with asphalt concrete, and the remainder of the road will receive a chip seal surface. Construction is expected to begin in the summer of 2019.